Predictive analytics includes a set of functions that leverage customer information to construct interesting assumptions about future potential customers. They play an integral role in determining a customer’s lifecycle. What’s more, predictive analytics influences company strategy even before any prospect gets converted into a lead. That’s the way it functions, and as the leads are converted into customers, the new data collected impacts the next-generation marketing activities. The process is almost cyclical. 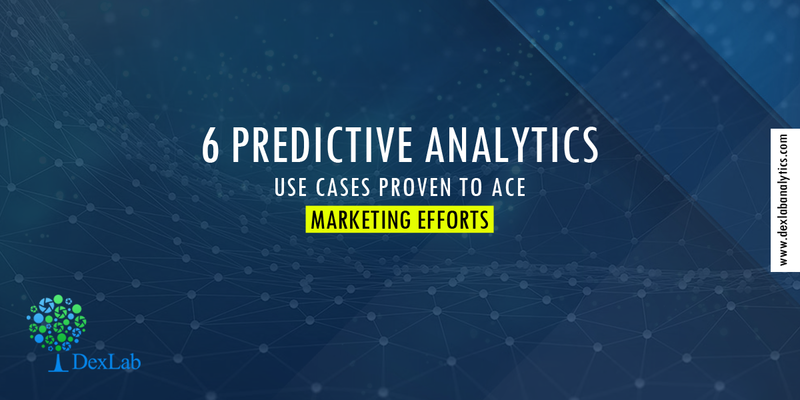 In this post, we will discuss about 6 use cases for predictive analytics that shows a significant impact on marketing ROI. With predictive analytics, lead scoring becomes a whole data-driven process that targets customers. It helps you leverage the actions of existing customers to build better future strategies. No more it remains an anecdotic listicle of measures from sales, instead it points out the ‘hot’ leads that can be pushed down through the funnel of sales. Remember, one-size-fits-all doesn’t apply to lead nurturing. For converting prospects into leads, a definitive plan for lead nurturing should be adopted. Predictive analytics is the hands-down tool to consider: take cue from behavioral and demographic data to push leads towards the sales funnel. Today, every company invests in quality content creation. Content marketing has the power to fetch measurable ROI for your company. And this is where predictive analytics play a vital role: it analyses the type of content customers would find interesting, based on certain behavioral and demographic data and then automatically distribute them to the prospective leads. Predictive analytics help learn from the past mistakes. Past behavior is a testimony of future behavior, and it holds true for customers, as well. A clear analysis of behavioral patterns of previously-churned customers in your company would help identify the red flags your present customers are showing, thus results in protecting your baseline for a better, secure future. Understanding what customers need becomes a tad too easier when you are armed with a set of behavioral, demographic and psychological data of your customers. Again possible with predictive analytics! Leverage customer data and figure out what they are looking for. Past performance analysis always leads to constructing better future campaign designs. As more and more new customers seem to enter your business, you need to leverage your data more precisely and curate content based on their preferences and requirements. And may even have to target specific audiences! So, treat past data as a treasure! As parting thoughts, these six strategies for predictive modeling are perfect for transforming your business. Today, data is the power. Clean, high-quality data have the potential to take your business venture to unforeseeable heights of success. And for that and more, DexLab Analytics is here to help. Our skilled consultants can crack the toughest data management problems and provide solutions to make predictive modeling using SAS better. For SAS predictive modeling training, peruse over our course section on the website.